Do you have a memory like an elephant? 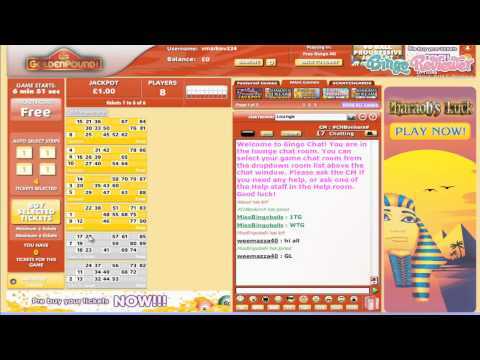 If so, you will surely remember Golden Pound Bingo for an invigorating online bingo experience. This is a pound dedicated to capturing the attention and admiration of bingo players seeking quality entertainment. The homepage inspires good times, good fortune and carnival atmosphere. The elephants are thought to bring good luck, particularly if the trunk is facing up and these four delightful trunks at Golden Pound Bingo are. The tone is set for entertainment and your master of ceremonies provides all the right elements to make it happen. The theme of this bingo site is definitely unique with a circus theme in vibrant colors of orange and yellow. It is nicely laid out with easy to navigate tools and a true vision of what all there is to offer without having to register first. Powered by Dragonfish software, players are assured of high standards technology and quality gaming. Golden Pound Bingo is owned by Cassava Enterprises and is licensed in Gibraltar. If you love to play bingo and enjoy the thrills of casino games then Golden Pound is the perfect online bingo site for you. The no download site is just a click away from entering the lobby to a world of exhilarating games. There are over 50 3 Reel, Multi Reel, Progressive Slots and Jackpot games up to £15,000. Slots have stunning graphics and invigorating themes with popular games like Cleopatra, X Factor, Monopoly and Wheel of Fortune. There are a variety of 75 and 90 ball bingo rooms available including Swiss Bingo and Free Bingo rooms. Players will find one of the biggest Bingo Jackpots online with the £1,000.000 Coverall game. Other games include classic hot games like Keno, Roulette and Scratch Cards. Enter the Featured Games tab to view all the wonderful choices waiting for you. The Bingazette weekly newsletter will keep players abreast of all the latest new promotions available during the week and on the weekends. Monthly promotions offer exciting and generous incentives. Free Bingo gives away over £6,000 in cash prizes monthly. Free Bingo rooms are available for depositing players and fun players. Happy Hour takes place every Monday where Double Loyalty Points are awarded. The Loyalty Program was designed to show appreciation for all players. As a BFF VIP players are spoiled with Monthly Cash Back, Network Promotions, Re-deposit Bonuses and more. The variety of promotional offers is never lacking. Huge Progressive Slot Jackpots and the one million pound bingo game is awe inspiring. We rate Golden Pound Bingo with 3.75 Pink Hearts. They have some unique ongoing promotions here and it really adds some flavor to a traditional dragonfish software layout. There’s one in particular that’s my favorite! Each month, they hold a special zodiac bingo game that is held under the sign that correlates to that date. There are a number of chances to win big! With one line, you can walk away with £61, two lines, £100, three lines, £150, and with four lines you’ll win £300. If you’re lucky enough to get a full house, then you’ll take away a whopping £500, plus 20 tickets to the next game! Every player will also receive 10 Free tickets for their sign’s game as a birthday gift. They bingo they offer is pretty basic, with 75, 80 and Swedish bingo. They’ve got coverall and progressive jackpots and a number of slots with free spin and bonus round features. They also offer a decent deal on free bingo! Golden Pound is not just a Bingo site, you can play Slots and other popular Casino games. This is a Dragonfish site, so I find most of the games well known. Apart from the regular 75 and 90 ball bingo, they also offer the popular Swedish bingo that is way faster. There is even a Free Bingo room, with games available every single day and that is great news for those who like to collect freebies. The promotions include a 150% bonus for the first deposit, and there's even a royal baby promotion, celebrating the birth of the baby prince. There are a lot of other promotions, most of those I have already seen before, but never the less, a good opportunity to get more for your money. This site had one of the fastest payouts I have seen so far, and I am really going back there to play soon. I absolutely love the layout here! It’s so pretty and unique looking. They have a nice amount of bingo to choose from as well. In fact, players have the option of choosing from three different types. They have 75 & 90 ball as well as high five bingo. High five bingo is one of my favorite variations and it always adds a little spice to a game that can get dull every once in a while if you are stuck with only one option. Plus, they have awesome jackpots here. The welcome bonus is ok. It’s a deposit bonus in which you have to make a minimum deposit of £20 free in order to receive an additional £30 free. I didn’t like that the initial deposit was a bit higher than most sites that require £10, although I guess you do get a bit more for your money here. This is definitely one of my favorite sites!